there's one big trick to provide a value for the porperty "instance": use for "Port" "1433;instance=instance_name"! It's ironic that you can use SQL Developer to look at an MS SQL Server database, but NOT to look at an Oracle 8i database! Thanks for adding your comment, I've been looking for hours on why I couldn't connect, and this solved it for me. The jTDS driver FAQ (http://jtds.sourceforge.net/faq.html) is a great resource if you're having issues. I've been using JDeveloper (similar to SQL Developer) for Oracle, never thought about using it for Sql Server. I'm going to start using that instead the outdated enterprise manager. I have been facing so many issues when trying to connect the SQL Developer with MS SQL but all the points are cleared after reading your post. I figured out what I was doing wrong that created the whole problem. Thanks for explaining each and every step for the connectivity. Hi, just added the JDBC driver to access an SS2008 database, but we can't figure out what to use for connection credentials. Maybe it's a bit obscured/harder because of the fact that I'm trying to connect from a Linux-VM on my machine to a MSW2K8server-VM running SS2K8 on his system. The user he told me to use is something like informatica\Administrator, with some password. But when I try to test the connection I always get ""Failure - Test failed: Login failed for user ". I've also tried it for just informatica, and just administrator, all to no avail. I've also tried to tick the "Use Default Password" box, no luck there. Haven't tried the "Windows Authentication" box. For hosthame I'm using the IP-address, and port is standard 1433. Trying the "retrieve database" button yields same error message. Windows Authentication does not seem to work on a Mac. Anyone got this to work? I can connect fine using a SQL Server login but not with an AD login. 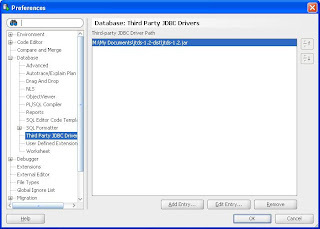 If you think about JDBC Driver Download you could here at http://www.datadirect.com/products/jdbc/index.html. Thanks! Your article helped me a lot. It was really quick and easy to configure the Oracle SQL developer to collaborate with MSSQL DB. Great. Unfortunately you can't run MSSQL Stored Procedures using Oracle SQL Developer. I find this extremely disappointing, and is a show stopper for my scenario. 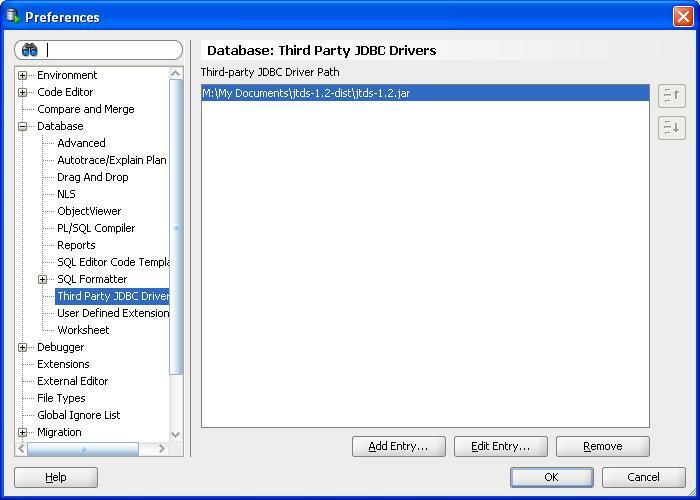 I add the jar file to the third party jdbc list however it results in the connection manager not coming up when you either click on add new or try to edit an existing connection. this works only with jar version 1.2 ..1.3 fails to connect to sql. Any way thankyou for the content....gr8 job. Hi.. everything works fine with sqldeveloper for MSSQLSERVER DB.. but i am unable to see the delete row icon under content tab.. could please let usknow what could be the reason??.. if that icon to appear is anything need to be configured?? I am able to connect to the SQL Server, and also i can view all my elements of this SQL Server instance. But when i drag and drop in the cart, when i click 'Deploy' it gives an error 'The objects are not Oracle Objects'. Is there are way to convert SQL Server objects into Oracle Objects. Unknown packet type 0x48, please help me.. This is such a nice post, actually I'am new in Oracle industry and I don't know much about so that's why I'am looking on the web for tutorials and Oracle Consulting and Oracle Services to gain my knowledge about Oracle. Thank you so much for sharing such a nice post with us. Very Nice Thoughts. Thanks For Sharing with us. I got More information about Java from Besant Technologies. If anyone wants to get Oracle Training in Chennai visit Besant Technologies. 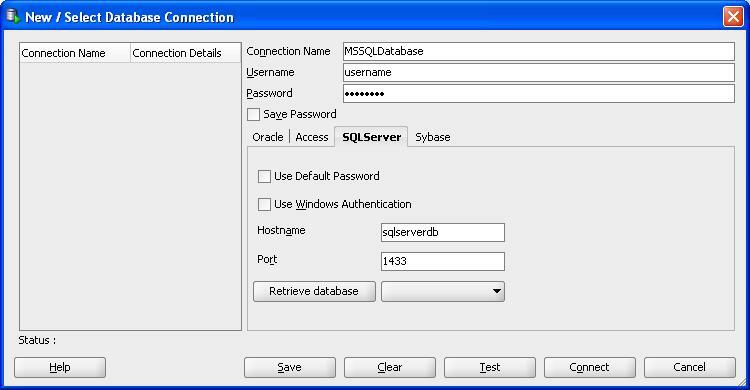 I was not able to connect to SQL Server 2008 until a User ID was created on the SQL Server database. I could not connect using my own User ID or Windows Authentication. This post is really good. It can help me perfect but while I am facing some problem with SQL, it cannot work well than I can download sql database recovery tool. It was work wonderful on my system and solve all the problems. Now I can connect to MS SQL using oracle sql developer, that's interesting. This information which you provided is very much useful for us. I have granted the all required permission to the User But it still generating the same error. I am trying to create a database that will have all of my employees stats and task efficiency records. Is something like the SQL Client a program that I could use to get this idea accomplished? It would would be nice to have everyone I oversee, on the same page. hi,this is the good information i have being for this sites information..
Oracle database course students can clear oracle global certification exams like OCA, OCP ,OCM.Trainingbangalore povides latest oracle version training like 10g,11g,11g R2.Our training center equiped with high level lab facilites. I observed some kind of stuff in your blog. That makes all to tend your blog. Keep it up. Yes that is true. Such a blog. Anyone can do everything. Awesome blog. I am waiting for your next blog. Can found little difference in all your part. Such an awesome usability. This article is nice to read and updating the knowledge also. Thanks for sharing. Hi I am Victoria lives in Chennai. I am a technology freak. Recently I did Java Training in Chennai at a leading Java Training Institutes in Chennai. This is really helpful for me to make a bright career in IT industry. This blog is really very helpful.It helps for the oracle interiew thank you friends.. Very informative post. If interested, one can take up AngularJS training in Chennai and stay up to date in technology. Thanks for sharing this informative blog. I did SAS Certification in Greens Technology at Adyar.This is really useful for me to make a bright career.. Informative article. Helped a lot as I used it in training my students. Thank you, keep writing. This informative post helped me a lot in training my students. Thanks so much. Hello Admin, thank you for the informative post. At Fita academy, we provide the best IT trainings for various courses. You can check our Fita reviews page to know more about our quality and standards. Wow, brilliant article that I was searching for. Helps me a lot in taking class for my students, so using it in my work. Thanks a ton. Keep writing, would love to follow your posts. Wow, brilliant article on dot net training in Chennai that I was searching for. Helps us a lot in referring at my dot net training institutes in Chennai. Thanks a lot. Keep writing more on dot net training Chennai, would love to follow your posts and refer to others in dot net training institute in Chennai. Thank you for this detailed article on web designing course in Chennai. It has been really helpful during my web designing training in Chennai, as I used the details in your web designing courses in Chennai as a reference to my students. Thanks for post this useful informative article to our knowledge, Actually nowadays salesforce utilized in many organizations for their business activities it has great scope in future. Using Oracle SQL Developer with MS SQL- this will be useful for the Oracle developers, we offer high quality of salesforce training. Clear Explanation of installation with configuring process. Our experts offering you the best training on salesforce, which makes you to develop your career in a right way. Our .NET Training in Chennai is completely looking to offer this Dot Net training in various places in and around Chennai. Our Dot Net training centres are equipped with perfect environment to learn with all required facilities. We guide our Dot Net training students to be a certified at end of our course. In the last six months timeframe we are completed Dot Net training for more than 90+ students with excellent feedback and placements.. Thanks for post this useful informative article to our knowledge, Actually nowadays iOS Training in chennai utilized in many organizations for their business activities it has great scope in future. Excellent post, some great resources. Styling your blog the right way is key. This information is impressive..I am inspired with your post writing style & how continuously you describe this topic. After reading your post,thanks for taking the time to discuss this, I feel happy abouit and I love learning more about this topic. java training in Chennai utilized in many organizations for their business activities it has great scope in future. Thanks for suggestion it indeed a good blog for java developer, added now. Here some of the execution part also available so it will be familiar that one can understand what is going on without third party knowledge. I really expect like this type of article contain examples or some other demos.